The objective of this experiment is to observe electric potential and it's effects in the space around two oppositely charged electrodes. 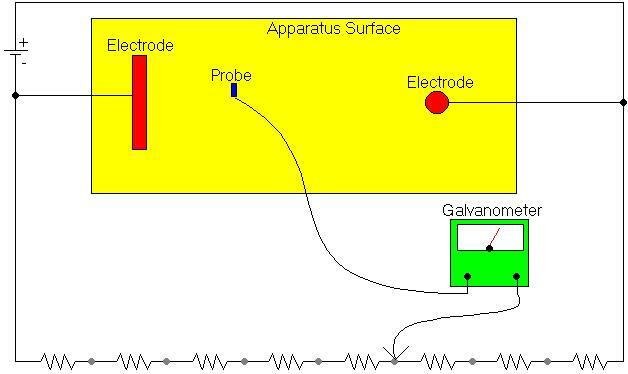 2) Move the probe attached to the galvanometer around the surface of the paper between the 2 electrodes until a zero reading is obtained, mark those points. 3) Repeat until at least 5 null points have been found. 4) Draw a curve for those 5 points. 5) Repeat steps 2 through 4 for each resistor connecting point. 6) Draw the force lines tangent to the curves drawn. 7) Repeat steps 2 through 6 for both of the remaining plates. 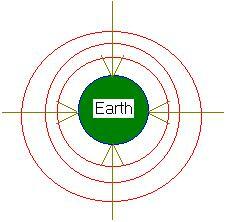 1)	Q:	Show the gravitational force around the Earth. 2)	Q:	Give the formula for work using Force and Distance. 3)	Q:	What work must be done to move a force along a gravitational field and a surface? 4)	Q:	What work must be done to move an object between two surfaces of equal gravitational potential? 5)	Q:	What would be the formula if the object did not move in a straight line. 6)	Q:	Compare the electric field near a sphere to that between the plates, show how the field varies with distance and the flux density is different. A:	The electric field between he plates is a parallel force with a high flux density. Additionally the force is uniform. 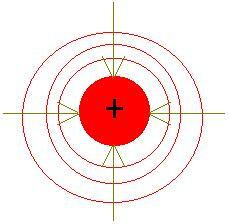 The force around a point charge is spherical and it's flux decreases with distance. The field is not uniform, it decreases with distance. 7)	Q:	Sketch the force lines surrounding a positive particle. 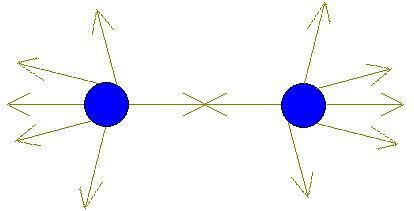 8)	Q:	Sketch the force lines surrounding two negative particles. From this lab it is concluded that there is a definite and defined field surrounding various types of sources that can be predicted. However this lab fails because of inadequacies in the equipment used. The apparatus used in this experiment was based on an incorrect principle (resistance fields) and was incorrectly calibrated (Points 1 and 7 had too high of a potential that adequate readings could not be taken.) Additionally imperfections (dirt, dust, etc.) made many readings inaccurate.